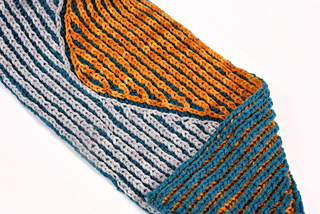 This project is a gentle introduction to brioche intarsia colorwork. 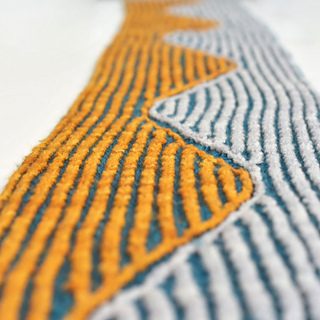 The wavy colorblocking was inspired by the path a skier leaves in the snow as they make their way down a mountain. 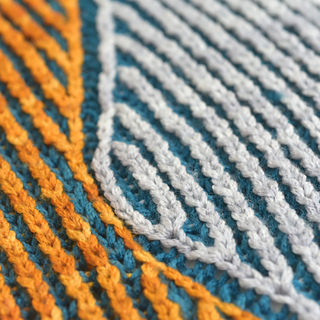 If you already know 2-color brioche, you may find the intarsia color changes in brioche stitch to be easier than they are in stockinette stitch! 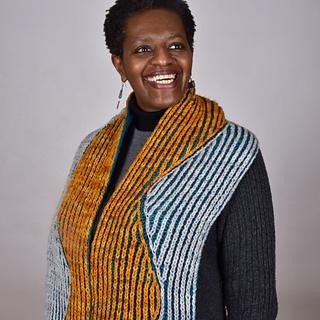 The pattern uses simple brioche increases and decreases to change the ratio of the colors on each side of the wave. The shaping instructions are simple and easy to memorize so you can focus on learning the intarsia technique. Videos of each increase and decrease used in this pattern are available on YouTube. If you haven’t tried any brioche stitch before, you may want to try a simple project first to learn the terminology. Finished Size: 8.5” (21 cm) wide and 60” (152 cm) long. Yarn: MollyGirl Yarn Harmony, 270 yards (247 m) per 100g; 100% merino wool. Harmony is a chainette yarn. 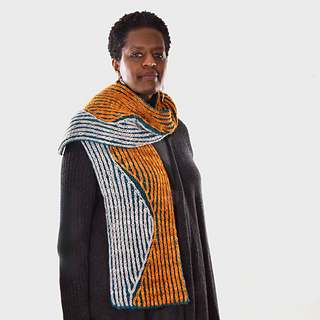 Instead of a traditional twisted construction, it is made of a long chain of knitting. 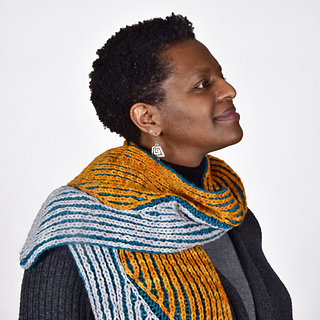 This type of yarn is extra springy, light, and warm. Each skein also contains more yardage than a standard yarn in the same weight. If you do not use a chainette yarn, get an extra Dark Color skein. You may also need a smaller needle size to obtain gauge. Needles: Size 10 (6 mm) circular needles or size needed to obtain gauge. Gauge: 18 sts x 16 rows = 4 x 4” (10 x 10 cm) square in brioche stitch. Materials: Crochet hook, stitch marker, blocking surface, steamer.